The size of the world will be big, feeling endless. But the goal of Orbis Infinitas will be to create a roleplaying world that feels like a real fantasy world. I do not want to create a world, where you can reach the end of the world in a hour. In this game you will never see the whole world, but that’s okay. There’s nobody in our world, who saw every part on earth. But you will feel, that you are in big world, where global politics shape the world while you are playing and doing smaller stuff. Never heard from Orbis Infinitas? Orbis Infinitas will be a procedural generated roleplaying game, where everything will be generated based on a given seed at the game start. This includes the world itself, cities and towns, dungeons and forests, empires and politics, characters and monsters, but also the whole story, background and quest system. 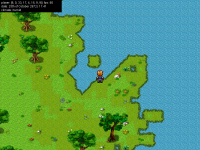 Everything will be generated on the fly and a player can be part of a world that seems to have no borders. You can walk and walk into one direction and maybe you will never find the end of the world. The new engine is onee again based on Java but I created it once again from scratch to build a well base engine for the whole game... Stay tuned and look out for some more screenshots and information in the near future! Help Orbis Infinitas getting real! @indiegogo Igg.me Please retweet!